It may look kind of weird but the one person�s name that has to be brought up here neither played or sung on this album. Mark Wirtz is the mastermind behind this long-forgotten concept LP released in 1970 by Chapter One Records, a one-off studio project he put together with his girlfriend at the time, Maria Feltham, who wrote most of the songs. Although the album is supposed to be driven by a common concept, its sound gravitates towards broad influences: there are fierce guitars and also soft psych passages, it gets as close to easy listening as to rock. During the 60s Mark Wirtz was an in-house producer for EMI, working on the Studio 2 series. The next milestones in his career were “A Teenage Opera”, a musical project that was never released as an entire work, and producing Tomorrow�s self-titled debut LP, a psychedelic masterpiece. 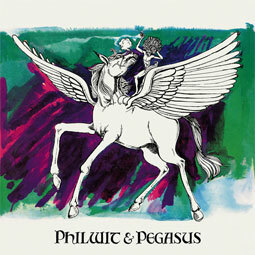 In 1969 Mark resigned from his post at EMI Records to return to independent production and approached Les Reed�s Chapter One label for the release of his new Philwit & Pegasus project, recorded by a group of musicians that includes John Carter (The Flower Pot Men), Roger Greenaway or Peter Lee Stirling on vocals, and Chris Spedding on guitar, among other talented artists. The album starts with �Happiness�, featuring incredible vocal harmonies, followed by the outstanding �Yoyo Thoughts�, a folk-pop delight, but half way through it we reach some of the strongest songs on the LP: the energetic �My What a Lovely Day It�s Been�, �Lonely Flower� and �Spinning Carousel�, which echo The Beach Boys and Love and create an intimate yet vaporous vibe. Fans of sunshine and chamber pop coupled with memorable songwriting will be enthralled by this album.